Hi! 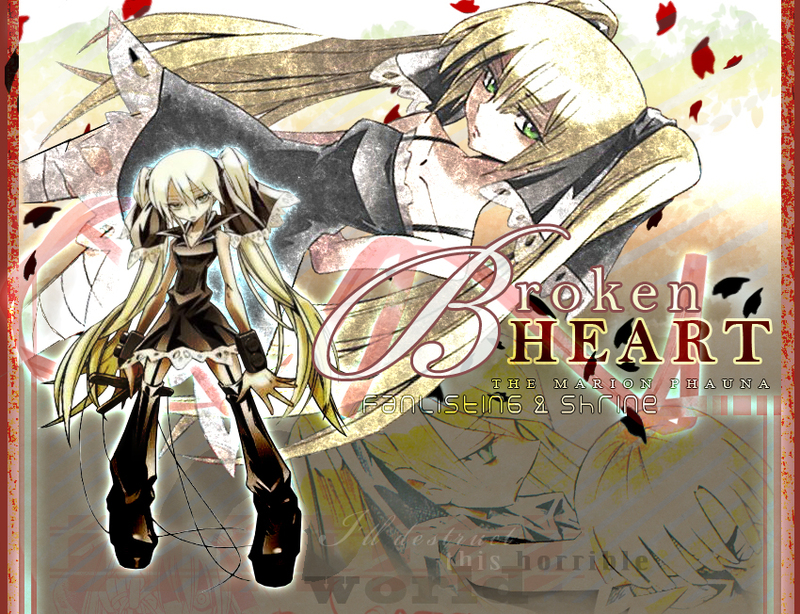 Welcome to "Broken Heart", the TAFL approved fanlisting and a little shrine dedicated to Marion Phauna , a marvellous character from the series Shaman King, created and illustrated by Takei Hiroyuki! Marion is an enigmatic girl, she hates the world because in the past she has been marked as a witch and all rejected her for this reason. She didn't know love and kindness, so she grew up alone with herself and her hate. Day by day, Marion became schizophrenic and even if she knew that other two girls like her (Kanna and Matilda, with whom she composes the Hanagumi Team) were sad for this "rejection" of the world, she remained introverted. This fanlisting has been created by Seiyuuki and after her, owned by Shaza, that I want to thank with all the heart because she kindly let me adopt it in May 2009! Thank you very much, I'll take care of her forever! Please, choose a link fromthe right to fully access the site, and if you're a fan of Mari, feel free to join her fandom!